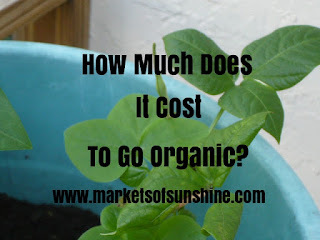 How Much Does It Cost To Go Organic? Last week I told you I was going to expand my posts to include my holistic and organic lifestyle tips with you. So, let's get started. How much does it cost to go organic? The bottom line. That depends on how much you think your health is worth. Really! It is totally up to you to determine how much you want to spend on natural and organic products to improve your health. If, you always place a price tag on your health you are playing a dangerous game with your life. Really! I have known several friends and friends of friends who have died because they placed a price tag on their health. They put off buying the things that would have saved their life because of how much it was going to cost them. That's right! Money was more important to them than their own life. To me that is not what God intended for us to do when he gave us free will to choose for ourselves what we would do with our life. But, it is in the end, it is totally up to each one of us to say how much our life is worth to us in the long run. So, how much is your life worth to you? Once, you can answer that question you will know how much it costs you to go organic. What helped me determine how much my life was worth to me was when I came face to face with death. It was exactly 11 years ago on May 30, 2005 when I had to decide what my life was worth to me if I wanted to live. It has cost not just me but my whole family thousands of dollars to save my life. We have had to refinance our house twice. We gave up every non-essential pleasure and addiction such as eating out, cable TV, going to the movies, going on vacation just to keep me alive. Conventional medicine no longer works for me. It is poison to my body due to all the chemicals they put in me testing to try and find out what was wrong with me. In the end, it was Lyme disease. I would guess to estimate that there are only 1% of medical doctors and nurses who can spot the symptoms of Lyme disease when a person comes into their office with all the weird symptoms Lyme creates in your body. For, me it was 1 year later that I finally got to a alternative health doctor who was able to test me and find out it was Lyme disease. 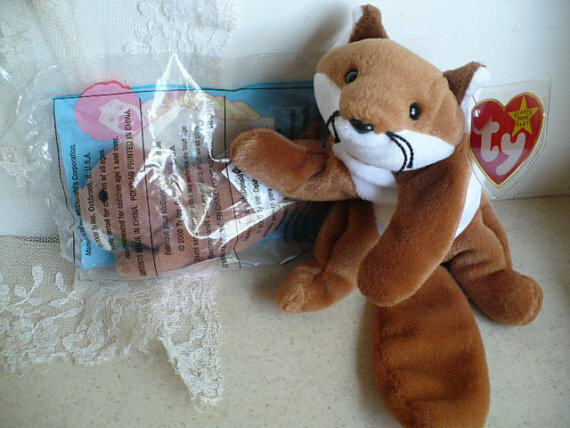 I then went to a medical & naturalist doctor who did a blood test that confirmed the diagnosis. The CDC has now realized that the old Western Blot and Eastern Blot tests are not accurate. They only give the right results 1% of the time. If, you have had Lyme for more than 3 months that is when these tests come back negative because the bacteria are now deep within your body hiding. Where do I buy my organic food? Glad you asked. I go to several stores to find the lowest prices and the best USDA certified organic foods. If it does not have this label it can have pesticides used on them during growing. 100% USDA certified has zero pesticides and only natural bug control methods. I have no allergic reactions to any of these type organic foods that I buy. The one food that I must say seems to be difficult to grow that tastes like organic are the orange sweet potatoes. I don't know what is happening with that crop but they are full of rotten spots when they get to the stores. And, they taste awful. I buy the white sweet potatoes now and they taste fantastic! These stores carry them: Publix, Whole Foods and Fresh Market in Florida. What is on my menu today? Organic buffalo, black eye peas and chicken, acorn squash and finally oatmeal with coconut milk. I buy the black eye peas in the dry bulk section at Whole Foods and cook them myself and then freeze them in serving size portions. The acorn squash I put in a casserole dish like you see in the picture and fill with purified water about half way up the sides of the dish and then bake in the oven at 350 degrees for 45 minutes or until a knife goes in easy. In the morning I eat a meat with one of my legumes or vegetables. For lunch I eat another meat with a different vegetable. For dinner I have a vegetable and gluten free grain such as quinoa, oatmeal or millet. (supposedly millet turns into gliadin after it is digested) I take Similase GFCF digestive enzyme with every meal that helps the body digest gluten and casein traces in your food. I also shop online with VitaCost to buy my gluten free grains. I shop Pure Formulas for my supplements and use Ebates to get cash back on each purchase from both of these sites. Check out my other money saving sites to see where else I shop to save on natural and organic products for the home. Next, week I'll do an article on going green with household products. You can also get more of my gluten free recipes in my Etsy shop, MarketsofSunshine. We love reading your comments and we reply to each one. If, you really like our post we'd love for you to share it with your friends using the social media buttons at the bottom of the post. This week I thought I'd surprise you with a fun weekend DIY project. It will take adult supervision if there are young children helping you. Here is my PDF download instructions on how to make your very own hollow book box in a weekend. Step by step instructions are included for 2 skill levels. One for beginners for those with no power tool skills and one for advanced woodworking folks who know how to use power tools aka saws. If, you have any questions once you receive the pdf file, feel free to contact me through our Etsy shop MySecretCompartments. This is the final week of our 4 weeks to a clutter free room challenge. Yay! we made it to the end of this project and we are still in one piece. hehe! 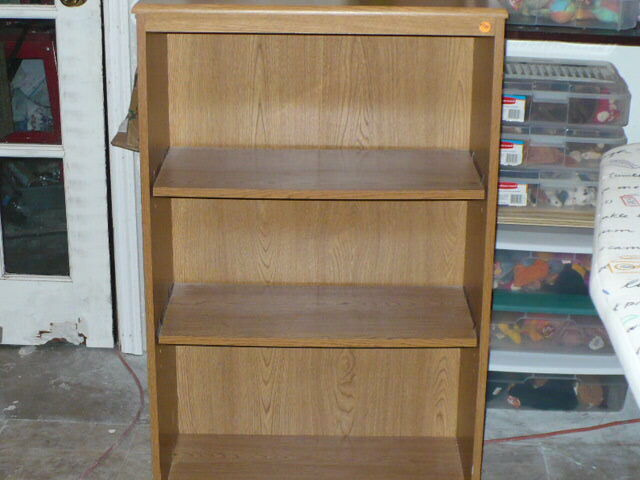 As you can see the bookcase now has our book inventory all neatly organized on the shelves. The floor is clean and clear leaving plenty of room for dancing when the mood strikes me. Spencer our Yorkie insists on being in the heart of the action. But, he is such cute clutter. giggle! The next project will be to go through each and every drawer, bag and container and do the same 4 step process again. That will be coming up this Fall. 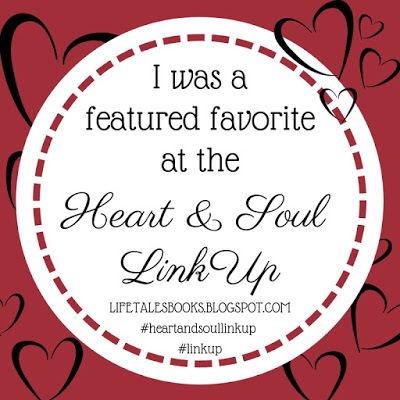 Stay tuned to this blog! Leave a comment updating me on how you are doing with your clean up challenge. I'd love to hear from you. P.S. Coming next month a whole new theme will be added to my book lover's theme. I'll be sharing my own experience and knowledge with holistic alternative treatment options and eating organic on a budget with gluten free recipes and money saving sites to shop. For most of the country it is back to school in just 4 weeks or less. Yikes! Where did the Summer break go to? This is week 3 of my 4 Weeks to a Clutter Free Room Challenge. How are you doing so far? Now, for the fun stuff that I thought of for you to stay connected with your child all year in a fun way. Get a set of lunch box note cards, I just happen to have some available in my Markets of Sunshine Etsy shop starting the first week of August. Each day of the first week put a special message on the note card to empower your child to make it through that first week with flying colors. Then, the rest of the year do it the first week of every month and on very special occasions such as report card time etc...you get the picture. You've now taken the stress out of shopping for back to school supplies. You'll be organized in a flash using these tips. For those of us with grown kid's who still need help organizing our junk drawers, office desk etc..here are some tips for you that will help keep the clutter under control. Using the same method above using clear freezer bags. Empty the drawer contents on the table. Separate out the pens, pencils, rubber bands, paper clips etc... now place a label on the front of each size bag you want to hold these supplies and write the name on the front. Now, they have a home and you have an organized drawer. 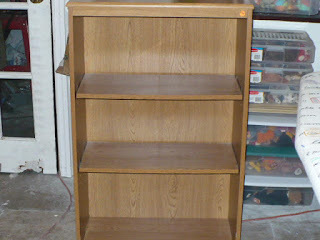 I found a bookcase at a garage sale Saturday that is the perfect size I needed to go next to the big one I showed you in week 1. If you remember there was a stack of boxes next to it filled with books. They will have a new home in this organizer's life. I'm not ready to show you the final results yet, just the empty shelves. You'll have to wait until next week for the finishing touches are completed and I show you the now tidy storage room. 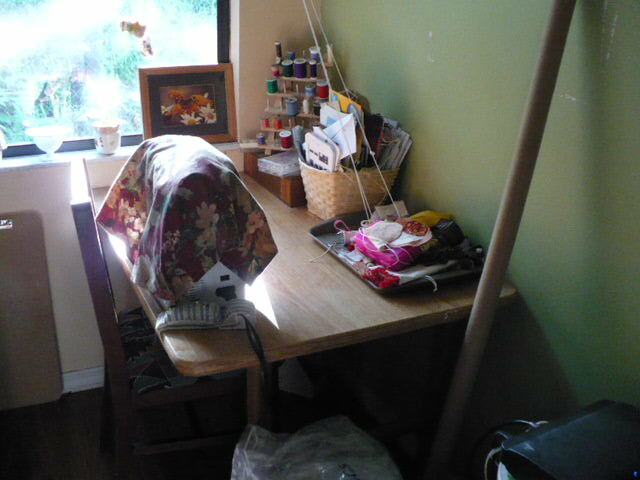 But, the floor in my sewing room is now clear and clean. See! My daughter and son-n-law were so happy to see the progress we are making in these 2 rooms of the house. I'm happy to say the rest of the house is clean and tidy. So, show me your photos and tell me your story on your progress in our 4 weeks to a clutter free room challenge. I believe in you! Keep going! You can do it!! See ya next week for the big reveal of my new product: Gifts in a box. Welcome to week 2 of our 4 weeks to a clutter free room challenge. We are tackling our house one room at a time. 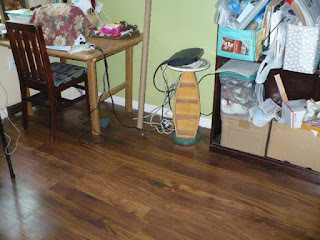 Last week I challenged you to a join me in my Summer break clean-up of my home one room at a time. In just 4 weeks to a clutter free room you should be feeling pretty proud of yourself right now in what you accomplished in week 1. I know I do. We are now in week 2 of our challenge. Here is my progress with my home office. 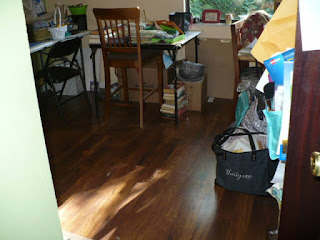 The floor is pretty much clean with just a few bags that need to go on another book shelf once my husband has it built. We are working on that today. He has been busy pressure washing off a plastic shelving unit we had stored outside that we will bring inside and use in my garage storage room. Once, it is in place and all the bags are organized I'll show you the results. In the meantime, here is what my office now looks like after the 1 hour I spent today cleaning and organizing the tables and floor. 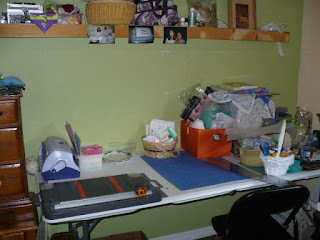 My friend Lynda from Icky Chic Design has joined me and I wanted to share her progress with you. Hop on over to her blog Between the Pages and be sure to let her know that Marsha of Markets of Sunshine sent you over to say: Howdy! You can jump in at anytime during our 4 weeks to a clutter free room challenge. If you do a blog post about it and mention my blog like Lynda did, I'll give you a shout out next week.